(Photo courtesy of Utah National Guard) Army Air Forces 2nd Lt. Lynn W. Hadfield, of Salt Lake City, was killed in a crash while flying a bomber aircraft on March 21, 1945, in Germany. His remains, in addition to those of his crew members, were found in 2016. On Tuesday, March 19, 2019, his remains will be returned to his family. He will be buried Thursday, 74 years to the date of his crash, at Veterans Memorial Park in Bluffdale. Just months before the end of World War II, Army Air Forces 2nd Lt. Lynn W. Hadfield was piloting a bomber plane from France to Germany when it was struck by anti-aircraft fire and crashed somewhere near the German city of Dulmen. Crews scoured the landscape for the Utahn and two other men in the plane, but found nothing conclusive. That is, until 2016, when a German researcher found evidence of a crash site in Hülsten-Reken, about 10 miles away. On Tuesday, his remains arrived in Utah. And Thursday, 74 years to the day of Hadfield’s crash, he’ll finally be laid to rest by friends and family back home. 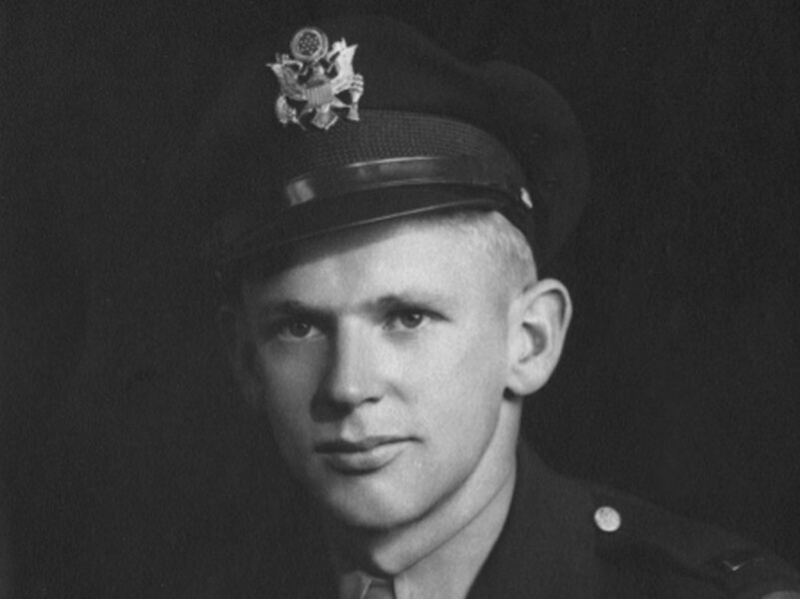 Hadfield, from Salt Lake City, was 26 during his last bomber mission, meant to obstruct German troop movement as Allied forces crossed the Rhine River two days later. Crewmen Sgt. Vernon Hamilton and Sgt. John Kalausich were also aboard, according to a statement from the Defense POW/MIA Accounting Agency. In June 2016, German researcher Adolph Hagedorn found what appeared to be an aircraft crash site inside a horse paddock. That winter, crews excavated and found parts of the bomber, medical equipment, personal mementos and possible human bones. Before the crash site was discovered, Turner said her only knowledge of her father’s death was what was in the telegrams her mother and grandmother received — the general location of the crash, and that Hadfield was missing in action. Researchers were able to determine the exact time of the crash and even the angle of the plane as it hit the ground — 45 degrees, Turner said. The excavation team also recovered Hadfield’s officer wings and his ID tag, which Turner now has. Now Turner’s relatives and friends are gathering in an unforeseen reunion to pay respects to the war hero. Hadfield will be buried Thursday — the anniversary of his death — in Bluffdale Veterans Memorial Park cemetery after a funeral service at Larkin Sunset Gardens Mortuary in Sandy. The funeral will begin at 11 a.m., three seconds before the time of day that the plane crash was recorded, Turner said. The service will be officiated by the son of a World War II veteran who fought in the Battle of the Bulge, she said. Hadfield joined the Army Armed Forces on Dec. 22, 1942. He was a member of the 642nd Bombardment Squadron, 409th Bombardment Group, 9th Bombardment Division, 9th Air Force. Turner plans to visit the crash site in Germany with a cousin who speaks German and hopes to thank Hagedorn and others who helped recover her father’s remains. “It’s indescribably beautiful that a German man would do this for an enemy aircraft," she said.